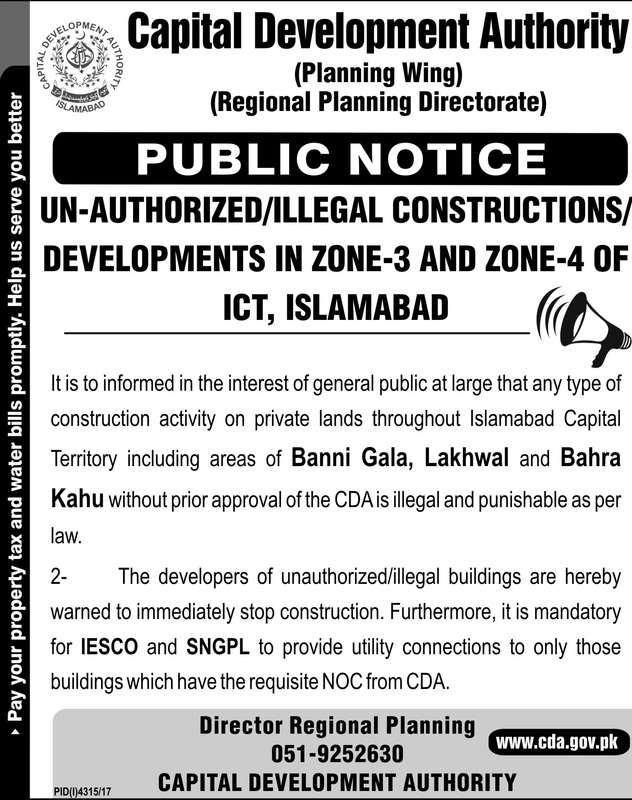 According to this new notice, there are several residential and commercial projects being constructed in Zone 3 and Zone 4 of Islamabad including Bani Gala, Bhara Kahu and Lakhwal. CDA has declared all such projects illegal which do not have approval letters from CDA. CDA has also warned such builders to immediately stop construction of illegal projects, or else CDA will take necessary legal action against them. Furthermore, CDA has advised SNGPL and IESCO not to provide electricity and gas connections of illegal buildings. General public may not necessarily follow such notices by CDA, and illegal projects will sell openly in the market without any hurdle. CDA must pick up some courage and exercise their powers to implement the rules rather than simply publishing useless notices for public awareness. CDA must also simplify the procedures and speed up the process of projects approval. Once the developers know the real consequences of flouting CDA rules, they will certainly follow all legal requirements.